Dear Guest, The Cottage is usually bookable in week blocks. But I do 2 ,3,4,5 night stays if you would like more or less nights please email me before you make a booking or payment on line. INCORRECTLY CALCULATES NIGHTLY RATES. THEREFORE ANY QUOTES PRODUCED CAN BE INACCURATE. PLEASE EMAIL OR CALL JANE FOR CORRECT PRICING OF EXTRA NIGHTS., Sincerely apologise for any inconvenience. Located in the idyllic village of Childswickham on the edge of the Cotswolds , Holly Cottage is set in walker’s paradise , or if you just want to visit all the stunning villages near by, the area offers such a variety of experiences for all ages. In our Quiet village location as a great base to explore from, With our fantastic village pub just around the corner, enjoy a taste of village life! We offer short breaks in low seasons , please contact me direct for prices. High season my bookings are from Friday to Friday . July to September. Many thanks. Holly Cottage is superbly located to explore such a large area , with Stratford-Upon-Avon a 30 min drive , Woodstock 45 mins away, The beautiful Malverns . it combines a quiet village location as we have no passing traffic with our fantastic Bistro/pub a 5 min walk away. ( so no driving ) in the evenings ! Broadway is Stunning you can just sit and watch the world go by in one of our Tea shops / or one of the 3 public houses, sophisticated shopping for all ages and tastes. Or just spend your days taking in great walking our amazing countryside . The Bathroom includes a shower, washbasin, WC and heated towel rail. On the Ground Floor. The Kitchen is fully fitted with an electric oven & hob, fridge with freezer compartment, dishwasher and microwave. Please not there is no washing machine . 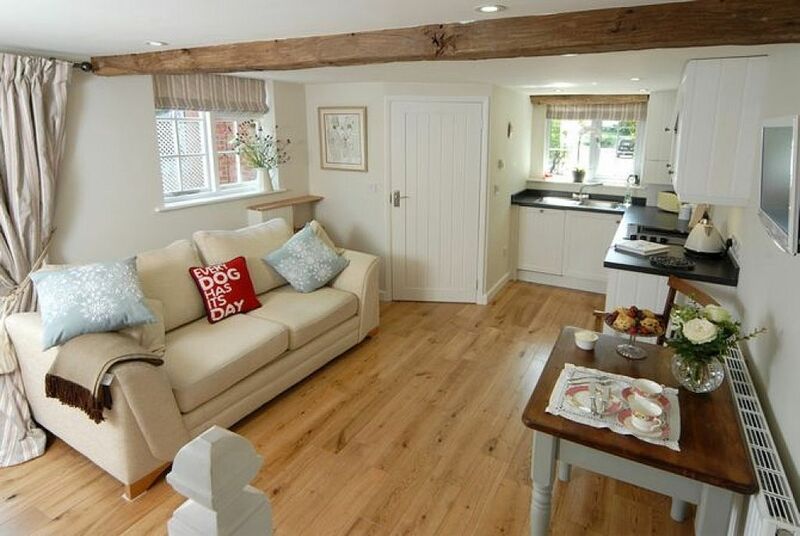 Very adorable cottage, perfectly location, great cotswold cottage feel. Spotless and luxurious. Lovely well-equipped cottage in fabulous Cotswold village close to Broadway. Thoroughly recommended. Many thanks for the lovely review. We are so pleased you enjoyed your stay at Holly Cottage, thank you for taking care of the cottage on your stay. And leaving it so clean , very much appreciated. A lovely spot to write, drink, walk to the local restaurant, and soak up Christmas spirit. Lots of countryside to explore by foot as well. 2 nights in this pretty cottage were most enjoyable. We are familiar with the Cotswolds and chose this area for it's proximity to the places we wanted to revisit.The cottage has everything required for a cosy and comfortable break. The local pub was great,good food reasonable prices,short stroll along the very dark lanes ..Torch handy ! All in all we had a lovely break . Broadway, typically considered one of the most picturesque towns in the Cotswolds is just a mile away where you will find a fantastic array of art galleries and great places to eat. Broadway Tower, offering one of England’s finest viewpoints across 13 counties on a clear day is nearby and within a short drive you’ll also find the picturesque towns and villages of Chipping Campden, Moreton-in-Marsh and Bourton-on-the-Water , Stratford Upon Avon, Lower Swell, and the fantastic Malverns a short drive away. Booking Notes: For Bookings request please email jane_galer@yahoo.co.uk. 07920 867145 Payment is by Bacs, cheque Please contact me by phone for booking confirmation and for security reasons. Normal change over are Fridays in High season , with short breaks available other times, short breaks available please contact me for prices and availability Check in is 4pm and check out is 10.30 am. If we can accommodate other timings please ask to fit with your travel plans. Changeover Day: Friday change over High season and short breaks available low season.